Beloved French restaurant Galvin La Chapelle has been awarded a coveted Michelin star for the ninth consecutive year. La Chapelle received its first Michelin recognition in 2011, and has been dazzling guests ever since. Chef-Patron and one-star Michelin Chef Jeff Galvin was delighted at the news, and praised his team for their efforts over the past years. The announcement was made during Michelin’s award ceremony on 1 October at the BFI IMAX cinema in Waterloo. Three more Galvin establishments have raked in Michelin accolades. 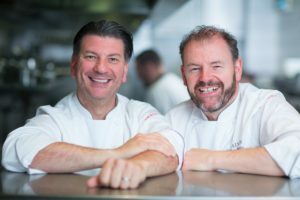 Galvin at Windows has retained its star for the 10th consecutive year, while the brother’s Essex Pub, Galvin Green Man, has been awarded a Bib Gourmand for the 2nd year. Galvin Brasserie de Luxe in Edinburgh also retained their Bib Gourmand for the 6th consecutive year. The Bib Gourmand is Michelin’s more budget-friendly alternative to the star rating system. To celebrate the good news with customers, all four venues are offering diners a complimentary glass of Galvin Champagne with their meal for the month of October by quoting ‘Michelin Guide 2019’ when making a reservation. For more information visit www.galvinrestaurants.com. Galvin Restaurants is a family run collection of French restaurants founded in 2005 by Michelin-starred chef brothers Chris and Jeff Galvin. Each of their restaurants is unique, but they all share a common theme; the desire to offer high quality cuisine, served in luxurious surroundings by warm, hospitable and professional front of house. The Galvin USP is ‘Family’ and the presence of Chris and Jeff in their own restaurants. Galvin La Chapelle was recently named amongst the Top 10 French Restaurants by Bookatable diners and in the Top 50 Restaurants in London. Galvin La Chapelle and Galvin HOP were included in TimeOut’s Recommended list for 2017, with Galvin Green Man being awarded a 2AA Rosettes.